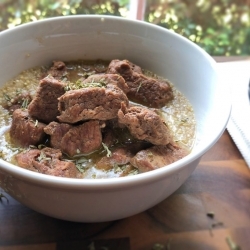 Because there is nothing like a down-home meal, this beef tips and gravy recipe will be a delicious addition to your main course rotation! Now the cook time takes a little bit, but the prep time…piece of cake! This is super hearty so be sure to pair with some veggies or a fresh salad to get in plenty of fiber and make it a balanced meal! Heat oil in a skillet and brown tips on all sides on medium-high heat, about 3-5 minutes. Add in stock, garlic, salt, pepper, coconut aminos, and onion (optional). Bring to a boil and then simmer, covered 1.5-2 hours. Add in gravy (recipe below) when meat is tender and cook until broth starts to thicken. Serve over quinoa or on it’s own! Bring to a boil whisking until well combined. Turn off heat and add to beef tips towards end as mentioned above.